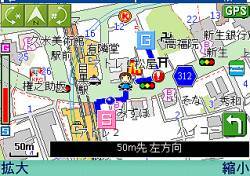 A GPS app on a Japanese smartphone. The GPS Council there told the FCC that any signal degradation could jeopardize the Global Positioning System’s standing as a global standard. LightSquared has dropped, for now, efforts to expand its wireless broadband plans to markets in other countries, Inside GNSS has learned. The Virginia firm was working this summer on proposals to the International Telecommunication Union, including one aimed at addressing compatibility issues between ground stations or “complementary ground components” of mobile satellite services and other frequency-using services. The company is currently fighting to win approval from the Federal Communications Commission (FCC) for a wireless 4G broadband network in the United States that would comprise as many as 40,000 powerful ground stations. The proposals to the ITU, however, have been dropped said Jeff Carlisle, LightSquared’s executive vice president for regulatory affairs and public policy. “My understanding it that [the requests for coordination] are not going forward as U.S positions, and we are not pursuing them,” Carlisle told Inside GNSS. Carlisle said there was already too much on the agenda for the upcoming World Radiocommunication Conference. Carlisle said LightSquared does not currently have plans to “build things in other countries,” and does not have licenses in other countries. He suggested the firm might seek to expand at some point after other nations see the LightSquared network operating successfully. Though LightSquared’s international ambitions have been put on hold, the increasingly nasty fight over the system’s future in the United States is shaking the confidence of America’s allies and trading partners. “It was clear from . . . our international partners how absolutely aghast they are that we are even having to discuss this,” said Ruth Neilan of the Jet Propulsion Laboratory. Neilan is a member of the National Space-Based PNT Advisory Board which debated the LightSquared proposal during the its meeting in Washington in November. Letters expressing grave concerns about the LightSquared network, which has the FCC’s conditional approval, were also sent to the FCC by the International Air Transport Association and the European Commission. The Commission said its own testing confirmed the interference in the radionavigation band used by GPS – the same set of frequencies the Europeans plan to use for their satellite navigation system. Most of the discussion among GPS receiver manufacturers has focused of retrofitting current U.S. receivers and adapting new devices to allow for LightSquared. Should the project get a go-ahead, however, it has the potential to bifurcate segments of the global receiver market in the same way that the world’s market for cell phones is split. Martin Harriman, LightSquared’s executive vice president of ecosystem development and satellite business, recently told the advisory board that changes to U.S. GPS receivers to make them compatible with LightSquared could make it necessary for high-precision receiver manufacturers to make one type of device for the United States and another for use internationally to be able to tap essential augmentation services. Such changes would almost certainly — but for now, unpredictably — affect those manufacturers planning single receivers that combine GPS signals with those from systems like Galileo, Russia’s GLONASS and China’s new COMPASS constellation. Aviation users have been particularly worried about the LightSquared proposal and are expected to bring their concerns to Congress in a hearing early next year.